James Wan has had enough of ghost flicks. 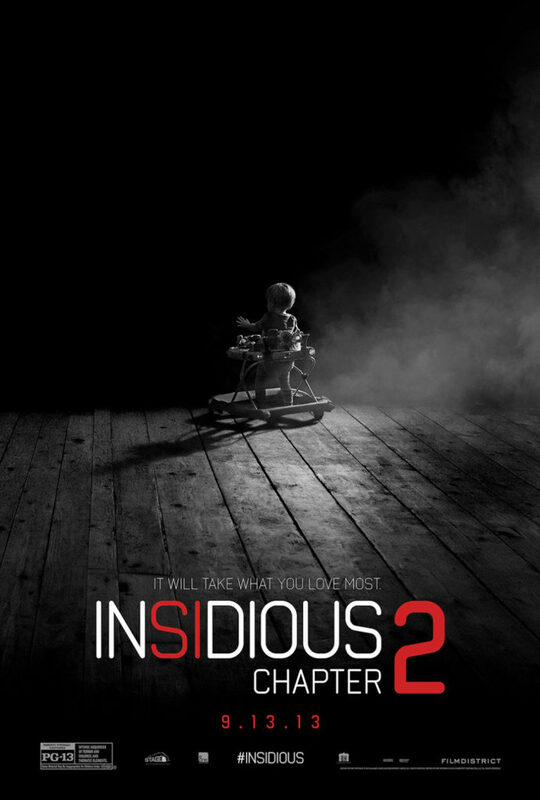 Insidious: Chapter 2 is the third ghost flick he directed in as many years, following Insidious and The Conjuring. To prove that a person can get sick of doing anything they love, and trying something new can lead a person to extremes, his next movie is going to be Fast & Furious 7. That’s right. James Wan has had enough of horror and decided that the best way to revitalize his interest in film is to direct Jordana Brewster, a woman who is to acting what Michele Bachmann is to reason and logic. Maybe it’s all about budget. The combined expenditures for the production of all six feature films that Wan directed, about 67 million bucks, equal a third of the reported budget of Fast & Furious 7. Hey, I can’t blame Wan for wanting to dip his toes into Michael Bay territory. That guy has a nice house. I bring this up because, at times, Insidious 2 feels a bit mailed in. The first Insidious and The Conjuring are both excellent horror films. The two are aware enough of genre conventions that they know where avoidance, and where exploitation, are the best practices. There’s no such awareness in Insidious 2. Screenwriter Leigh Whannell, who penned both the original and this sequel, stated that one of his intentions in the first film was to avoid cliché. He didn’t succeed completely in that regard, but one of the reasons Insidious was so good was because it never played ghosts by rote. Insidious 2, while being far better than the normal garbage that populates the ghost subgenre of horror, does not distance itself as well from cheap horror as does its predecessor. The good news is, that assessment only applies to certain times when the movie tries to scare you. And a couple of eye-rolling lines of dialogue sprinkled here and there. The actual plot of the film is a neat corkscrew that spreads across multiple points in time and dimension. Without giving too much away, certain throwaway moments from the first film are shown to have origins in the second film, and the transition between the two is seamless. Ideas like that don’t just pop into a writer’s head. They take work. Good job, Leigh. As for that plot, Patrick Wilson and Rose Byrne return as Josh and Renai, a couple with a family who are being terrorized from beyond the grave (these two show that any director with a miniscule budget is lucky to have them in the leads). Following the events of the first film, Josh and Renai find almost immediately that all the efforts they expended in purging the ghosts from their lives have come to naught...because otherwise there wouldn’t be a sequel. But never mind all that. Renai would love to enlist the help of spirit medium Elise (Lin Shaye), but she’s dead. Oh, boy. Luckily, Josh’s mother, Lorraine (Barbara Hershey), knows that death is no barrier. After some wild and crazy twists and turns, a final confrontation takes place. How this film resolves its story is up to the viewer to discover. Insidious 2, while not among the best ghost films, still shows that if serious effort is given to crafting a good tale, it will be a success. Production companies do not have to greenlight crap like Haunting in Connecticut 2 to make a quick buck. This flick only had five million bucks available to it, and brought home over 160 million. That should be enough to convince any Hollywood bean counter that quality and profit can be produced cheaply, hand in hand. They are not mutually exclusive.